This cruise spans 2,000 kilometers across Europe, from Amsterdam at the North Sea to Budapest, the so-called “Queen of the Danube”. Highlights of the cruise include the passage through the Rhine-Main-Danube canal, visits to numerous capital cities, unique landscapes such as the myth-enshrouded Lorelei rock, the “Schlögener Schlinge” below Passau, the picturesque Wachau region, and the Danube-knee at Visegrad (the Hungarian Wachau). Begin your exploration with a relaxing cruise through a myriad of landscapes along the Rhine river, For more active pursuits, spend the morning exploring the canal city of Amsterdam and the surrounding countryside, rejoing the vessel in the town of Utrecht in time for lunch. This evening join your fellow travelers for dinner. After breakfast, you'll arrive into the beautiful city of Cologne. Every year visitors from all over the world are drawn to the historical city and its 2000-year history. Explore the historic Old Town and visit the famous twin-spired Cologne Cathedral, along with the twelve Romanesque Cathedrals that span the city. There are many medieval houses, bridges, and gates that will delight the historian in you, while the more modern skyscrapers that tower overhead are sure to impress. To sample a bit of local flora and fauna, the National Park lies a short ride from the city. After an exciting day, return to the vessel spend the evening cruising the Danube. Early this morning, join your fellow travellers on deck for the famous passage of the Loreley. This narrow passage on the Rhine has inspired a modern day folklore story of the siren of the river. After breakfast the vessel docks in Oberwesel, the ‘City of Towers,’. Enjoy a walk around the wall that still surrounds much of the city. There are a large number of churches, as well as many historic houses that showcase the architecture of the 17th and 18th centuries. Spend the afternoon relaxing on deck, with the passing of the beautiful Rhineland countryside, as the vessel continues its journey. Today, choose to remain onboard for a relaxing day or join the optional excursion in the afternoon to Miltenberg and Wertheim, two towns famous for their architecture and museums. Both are unique in their own way and are reflective of the storied history of the area. In Wertheim explore the medieval streets with its half-timbered houses and glass museum. In Miltenberg walk through the streets lined with half timbered houses and historic market square. This evening, enjoy another memorable meal as the ship plies the waters toward your next stop. Following breakfast, enjoy your day in Nuremberg. Consider a visit to the romantic Old Town of Nuremberg, lovingly restored after the destruction incurred during World War II. 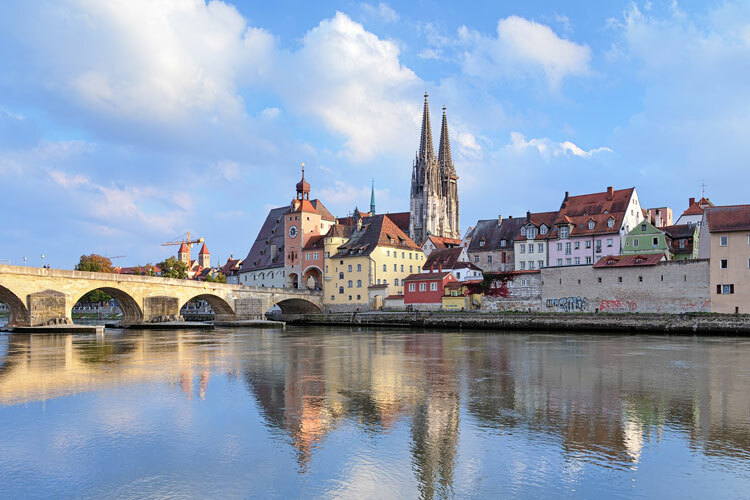 A hub for history, Nuremberg is home to many museums including the Documentation Center, which recounts the effects of the Nazi Regime and World War II on the city and surrounding areas. Back on board, it’s full steam ahead before crossing the European watershed separating the Main and Danube Rivers. In the afternoon, visit one of Germany’s most well preserved medieval cities. This UNESCO world heritage site boasts architecture from many centuries, reflective of its varied history throughout the centuries. The stone bridge, built in 1135-1146, the Church of St James, and the Schloss of Thurn and Taxis are a few of the highlights of this beautiful city. This evening is a special Bavarian theme celebrating the wonderful region cruised thus far. Arrive in time for lunch in the three-rivers city of Passau, lying at the confluence of the Danube, the Inn and the Ilz. Explore the city with its St. Stephen’s Cathedral, home to one oft he largest pipe organs in the world. The imposing fortress Veste Oberhaus is located high on the hill, overlooking the town and the three rivers. Back onboard, enjoy dinner as the vessel sets off toward the romantic Wachau Valley. In the early morning, dock in Emmersdorf, in the heart of the UNESCO-protected, cultural heritage landscape, of the Wachau Valley. Spend the morning discovering this typical small town in Lower Austria or travel across the river to nearby Melk and its magnificent Benedictine abbey. - the largest in Austria. Back onboard for lunch, continue through the vineyards of the Wachau to the village of Dürnstein. Spend the afternoon in the romantic village with its iconic blue church and winding streets, and perhaps sample the local wines. Vienna. After dinner, arrive in Vienna and opt for the “Sound of Vienna” and listen to the “Alt Wien” orchestra play popular pieces from Vienna’s classical era, at a local salon, as the vessel remains overnight. There is much to see and do in this Imperial capital city.. Drive the Ringstrasse with its impressive buildings, see the famous Vienna State Opera House, the Museums Quarter with historic and contemporary buildings with works by Egon Schiele, Gustav Klimt and other artists, St Stephen’s Cathedral and numerous other important sites. In the afternoon continue your exploration or perhaps venture to Schönbrunn Palace, the sumptuous former summer palace and gardens of Empress Maria Theresia. After a full day of exploration, enjoy a relaxing dinner onboard.